A French-America muralist, lithographer, easel painter, illustrator, sculptor and author, Louis Henri Jean Charlot was the son of a Russian-born emigré father who owned an import-export business in Paris and of an artist mother of part Aztec heritage whose family originated from Mexico City. Charlot, who began to draw around age two, grew up surrounded by the Mesoamerican manuscripts and Mexican art in the collection of his maternal great-uncle, Eugène Goupil. He also was fascinated by the pre-Columbian artifacts of a neighbor and family friend, Désiré Charnay, an archaeologist known for his explorations of Mexico and Central America and for the pioneering use of photography to document his discoveries. Charlot was educated at the Lycée Condorcet in Paris where in 1912 he won the French national scholastic boxing championship in the medium weight division. (Among the school’s alumni were Marcel Proust and Paul Verlaine.) He also studied informally at the École des Beaux-Arts in Paris where he became interested in murals and frescos. In the countryside near his home and during his travels as a teenager in Brittany he painted small landscapes in oil and pursued what would become a lifelong interest in folk imagery. In his teens he also belonged to a Catholic group, the Guilde Notre-Dame, a movement dating from World War I that aimed at reforming Roman Catholic ecclesiastical art in France. Drafted toward the end of World War I he became an artillery lieutenant in the Sengalese Troops. While camped at Sézanne some one hundred miles northeast of Paris, he began drawings for a fifteen-print woodcut series, Chemin de Croix (Way of the Cross), that was cut in Landau, Bavaria, after the war and printed in an edition of fifteen at Chaumontel, France, after Charlot was discharged from the army. In 1920 his portfolio was included in an exhibition of liturgical arts, Arts Decoratifs, in the Pavillon de Marsan at the Louvre. He also showed three designs for liturgical textiles and two friezes in watercolor for the decoration of a new church in a Paris suburb that he considered his first serious attempt at mural painting. The cancellation of his commission for the church mural precipitated his first trip to Mexico in 1920. He later commented, "On this first trip to Mexico I did nothing at all. I was stuck aesthetically in 18th century France." After a return trip to Paris where he exhibited his paintings, including L’Amitié in the 1921 Salon d’ Automne, he and his widowed mother relocated to Mexico where his grandfather had been some eighty years earlier. The time Charlot spent there strongly influenced the style and subject matter of his creative output for the next several decades. Early on in Coyocán, a Mexico City suburb, he painted at the open-air school, an annex of the Academy of San Carlos. He became acquainted with the work of the country’s three major muralists, Diego Rivera, José Clemente Orozco and David Alfaro Siqueiros. For two years he was an assistant to Diego Rivera during which time he completed his first fresco mural, The Massacre in the Main Temple (1922-23), presenting his image of the conquest of Mexico for the National Preparatory School (now the Antiguo Collegio de San Ildefonso) in Mexico City. He also painted other panels related to his fresco at the school. Due to his contact with Rivera, Orozco and Siqueiros, he became a chronicler of the Mexican muralist movement whose influence quickly spread to the United States prior to World War II. In 1945 he received a Guggenheim Fellowship to write The Mexican Mural Renaissance, 1920-1925, published by Yale University Press. He also documented the career of popular artist José Guadalupe Posada. The editor of Mexican Folkways Magazine (1924-26), Charlot worked from 1926 to 1928 as the staff artist for the Carnegie Institution’s archeological excavation of the Mayan city of Chichén Itzá conducted by Sylvanus Morley in the Mexican state of Yucatán. During that time he copied the Mayan reliefs found in the excavated buildings that later served as themes in his paintings and prints. He developed a great passion for Mayan art and indigenous Mexican culture, semi-abstracting the human figure in various geometrical shapes in his paintings and prints. In 1928 his work was included with those of twenty other Mexican artists in an exhibition organized at the Art Center Gallery in New York by Frances Flynn Paine, a manager of a Rockefeller Fund sponsoring Mexican artists. The exhibition was co-sponsored by the Mexican Ministry of Education and the Mexican National University. In 1928 Charlot arrived in the United States, supervising in Washington, DC, preparation of the illustrations and editing of the text for The Temple of the Warrior at Chichén Itzá, Yucatán (Carnegie Institution, 1931). In 1931-32 he taught at the Art Students League and became acquainted with lithographic printer, George Miller, who printed a number of his lithographs including the monochromatic First Steps (1930), the first of a number of images he created with this title. Charlot participated in group exhibitions of Mexican artists at the Museum of Modern Art in New York and at the Fogg Museum/Harvard University. He also illustrated The Book of Christopher Columbus (Yale University Press, 1930) by the French poet, dramatist and diplomat, Paul Claudel. In turn, Claudel wrote the introduction to Jean Charlot, Peintre Nouveaux (Paris, 1931). On a brief trip to Mexico in 1931 Charlot met his future wife, Zohmah (Dorothy) Day, whom he married eight years later in San Francisco. He completed illustrations for Harper’s Magazine and in 1933 produced a limited edition Picture Book (thirty-two color lithographs) with Lynton R. Kistler, a noted lithographer whom he met in Los Angeles. During that decade he participated in the Work Progress Administration’s Federal Art Project (1934-35), creating a mural – Head Crowned with Laurels (restored in 1955) – for Straubenmuller Textile High School in Manhattan (now the Bayard Rustin Educational Complex), as well as overseeing the work of its art students painting murals under the collective title, The Art Contribution to Civilization of All Nations and Countries. In addition to participating in the WPA-era art projects he taught fresco and lithography at the small, progressive Florence Cane School of Art at Rockefeller Center (1935-37), and lectured at summer classes at Columbia University. Time Magazine commissioned him to paint Nativity, published on the cover of its December 26, 1938 issue. In 1941 Lamar Dodd, Charlot’s former student at the Art Students League in New York, invited him to be an artist-in-residence at the University of Georgia that was funded for three years by the Carnegie Institution. During that time he painted an oil-on-canvas mural, Cotton Gin, for the post office in McDonough, Georgia. He also did a fresco mural for the Fine Arts Building and three murals for the Journalism Building at the University of Georgia, as well as fresco panels at Black Mountain College in North Carolina where he taught in the 1944 summer session. Following positions as artist-in-residence at Smith College in Massachusetts in 1944 and a Guggenheim Research Fellowship in Mexico in 1945, Charlot relocated to Colorado Springs in 1947 for a two-year tenure as director of its Fine Arts Center (CSFAC). He succeeded Boardman Robinson who recently had retired due to ill health. At the Center he taught fresco painting, numbering among his students muralist Eric Bransby and abstract expressionist Ken Goehring who moved to Colorado Springs after World War II. Charlot’s work in Colorado Springs -- including a small oil, Lovers -- primarily depicts Mexican subjects, representing a continuation of the images employed in his frescos in Mexico and in his prints published earlier in the United States. At the Fine Arts Center he worked with artist and respected printmaker, Lawrence Barrett, to produce eight lithographs. Child Tortillera and Dog was the first one he did with Barrett on a one-day flying trip from Los Angeles (where he was teaching at the Chouinard Art Institute) to Colorado Springs on August 1, 1947 to settle the details of his forthcoming position as Director of the Art School at the CSFAC. During his first year at the Center he was commissioned to do a print for its members resulting in Mexican Kitchen. However, Percy Hagerman, head of the Center’s Board of Trustees, rejected the three-color print and suggested he do another; but it also was not accepted, straining relations with the Center’s director Mitch Wilder and its board members. The following year the artist’s color lithograph, Mexican Mother and Child (aka Pilgrims), became the Center’s membership premium offering. He based the image on a sketch done a number of years earlier at Milpa Alta, Mexico. He also completed two lithographs as commissions for the Associated American Artists in New York: Procession at Chalma (1947) based on a Mexican scene from 1925; and El Volador (1948), showing a participant in a pre-Hispanic dance in Mexico in which fliers hang upside down from ribbons attached to a high platform and gradually unwind to reach the ground below. His accomplishments as a graphic artist resulted in his guest curating the anniversary exhibition of the American Institute of Graphic Arts, American Printmaking, 1913-1947: A Retrospective Exhibition, at the Brooklyn Museum and writing the introductory catalog essay. While at the CSFAC he painted Los Malinches (The Malinches), a colorful and spirited Mexican folk dance depicting Spanish and Indian contact. Originally commemorating the expulsion of the Moors from southern Spain in 1492, the dance later was brought to Mexico and used to Christianize the country’s native peoples. Los Malinches, included in the Eleventh Artists West of the Mississippi exhibition at the CSFAC in 1949, is now in its permanent collection. For the inaugural exhibition of the 15 Colorado Artists at the Denver Art Museum in 1948 Charlot contributed his self-portrait, as well as First Steps, a large canvas showing the pride and concern of a Mexican mother as she protectively steadies her child with her rebozo (shawl). In 1948 he created a true fresco, Tortillera (Tortilla Seller), for the storage room off the kitchen of the modest home where he and his family lived while in Colorado Springs. Depicting a woman preparing tortillas, her infant strapped to her back and cradled in a rich, blue traditional Mexican rebozo, the City of Colorado Springs later removed the fresco that now is in the CSFAC collection. In 1949 he gifted a small fresco of an indigenous woman painted in 1931 on Celotex to Lew and Martha Tilley celebrating the completion of their new home in the city. Charlot also directed the Art Program at the nearby Fountain Valley School, founded in 1930 as an independent school for boys. As director he oversaw the design and execution of a series of tiles for the patio fountain in the hacienda courtyard. He wrote: “Nearly every one of the FV art students pitched in to make a success of the decoration. Mexican motives, desert and mountains scenes, beasts of the earth and the sea, boots and hats, birds’ nests and donkeys, harmonize surprisingly against the plain adobe wall and green vines.” The class also created a tiled coffee table still housed at the school. Charlot’s proposal for a mural in Monument Valley Park commemorating Colorado Springs’ pioneers did not elicit support from the community’s art leaders. In the large fresco mural he planned to show wagon trains and early settlers moving against the backdrop of Pikes Peak. Although not able to realize his Colorado mural project, he did paint a mural in 1951 depicting the Hopi Snake Dance and the preparation of anti-snake venom for the Administration Building at Arizona State University in Tempe. 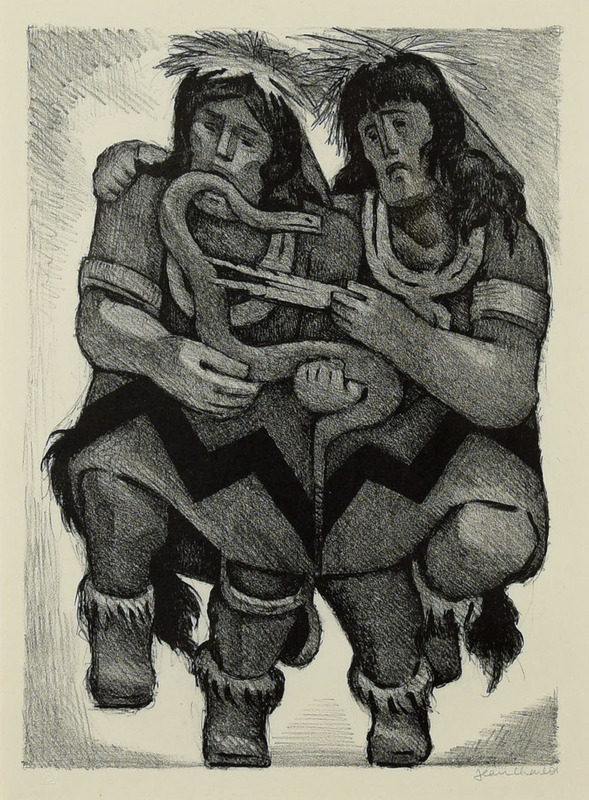 The following year he drew upon the subject matter for Snake Dance (Indian Snake Dance), a monochromatic lithograph commissioned by Associate American Artists in New York. In 1949 he left the Fine Arts Center on account of misunderstandings between himself and its Board of Trustees and director, Mitch Wilder. That same year the University of Hawai’i at Mānoa invited him to do a mural -- Relation of Man and Nature in Old Hawai’i -- at Bachman Hall, thereafter offering him a professorship in painting and art history from which he retired as Senior Professor of Art seventeen years later, spending the rest of his life in Hawaii. During his three decades in the state he produced more than 600 easel paintings, 700 prints and works of art in fresco, ceramic and tiles, as well as several sculptures. In addition to the University of Hawai’i, his murals can be found at the Hawai‘i Convention Center, Leeward Community College Theater and the United Public Workers Building in Kalihi. During his prolific career, Charlot illustrated books for children and adults. Among the former were two Newbery Medal winners: Ann Nolan Clark’s Secret of the Andes (1952) and Joseph Krumgold’s . . . and Now Miguel (1953) about a twelve year-old boy joining the male members of his family for the first time on their summer sheep drive into the Sangre de Cristo Mountains of northern New Mexico. Volumes for adults include John Farrow, Damien the Leper (1937), Hillaire Belloc, Characters of the Reformation (1937), and Thorton Wilder, The Bridge of San Luis Rey (1962). Solo Exhibitions: Art Center, New York (1925, 1928); Art Students League, New York (1930); Jean Charlot: Watercolors and Drawings, John Becker Gallery, New York (1931); Jean Charlot: Recent Work 1930-33, John Levy Galleries, New York (1933); Jean Charlot: Religious Paintings, Bonestell Gallery, New York (1940); Jean Charlot: Paintings from Colorado Springs Fine Arts Center, Dallas Museum of Art, Texas (1947); Honolulu Academy of Arts, Hawai’i (1950); Jean Charlot Retrospective, Fifty Years 1916-1966, Honolulu Academy of Arts, Hawai’i (1966); Obras Pictorias de Jean Charlot, Museo del Arte Moderno, Mexico City (1968); Paintings, Drawings and Lithographs by Jean Charlot, Georgia Museum of Art, University of Georgia (1976); Jean Charlot Retrospective, Hawai’i State Foundation on Culture and the Arts, Honolulu (1976); Jean Charlot: A Retrospective, University of Hawai’i Art Gallery, Honolulu (1990). Group Exhibitions: Pan American Union, Los Angeles (1925); Museum of Modern Art, New York (1930); The World Around Us: 100 Years of American Landscape, Dallas Museum of Art (1955); Images of Mexico: The Contribution of Mexico to 20th Century Art, Dallas Museum of Art (1988); The Latin American Spirit: Art and Artists in the United States, 1920-1970, Bronx Museum, New York (1988); MoMA at El Museo: Latin American Art from the Collection of The Museum of Modern Art, El Museo del Bario, New York (2004); Global Journey/Local Response: Works by Jean Charlot, San Diego Museum of Art, California (2011); The WPA Collection: Selections from the Modern Art Collection, Tucson Museum of Art, Arizona (2015). Collections: Uffizi Gallery, Florence, Italy; Metropolitan Museum of Art, Museum of Modern Art, Whitney Museum of American Art, Brooklyn Museum-all in New York; Fogg Museum-Harvard University, Massachusetts; Philadelphia Museum of Art; The Phillips Collection, Smithsonian American Art Museum, Smithsonian National Museum of American History-all in Washington, DC; Philadelphia Museum of Art; Art Institute of Chicago; Cleveland Museum of Art, Ohio; Walker Art Center, Minneapolis; Des Moines Art Center, Iowa; Museum of Fine Arts, Houston, Dallas Museum of Art, Texas; Los Angeles County Museum of Art; San Diego Museum of Art; Ruth Chandler Williamson Gallery-Scripps College, Claremont, California; San Francisco Museum of Fine Arts, California; Hawai’i State Art Museum, Honolulu; Honolulu Museum of Art; Isaacs Art Center, Waimea, Hawai’i; Hamilton Library, University of Hawai’i at Mānoa, Honolulu; University of Colorado at Boulder Art Collection; Colorado Springs Fine Arts Center; Fremont Center for the Arts, Canon City, Colorado; Kirkland Museum of Fine & Decorative Art, Denver, Colorado.